(Estestvennye i Tekhnicheskie Nauki, ISSN 1684-2626) 2004, Iss.1, in Russian. Data of researchers, that made photographs of hominoid footprints in Himalayas, were analyzed. 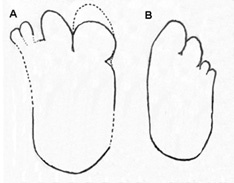 They confirm main features of feet shapes, that were seen in the photo by E.Shipton and M.Ward. These features (overdeveloped two fingers and wide sole) express a specialization of large hominoid legs to the life in Himalayan high mountains. The commonly known photo of hominoid tracks, that was taken by E.Shipton and M.Ward on a glacier near to Mt. Everest in 1951, is one of the most important data for definition of large Himalayan hominoids feet parameters. My previous analysis of the picture  has shown, that it contained the tracks made by two honinoids of a same type but different size. They are presented in Figs 1. Fig. 1. Contours of tracks of large Himalayan hominoids from Shipton's photo. The feet of hominoids according to the tracks were 35 cm long and 16 cm wide in the heel for the larger creature and 28 by 12 cm for the smaller one. So they have much common with the human foot, they also have evident essential peculiarities. They are very wide, that indicates the great weight of these animals. Their feet have four fingers only, two inner are developed and strong, and two outer are rather small. One may assume, that such form of feet and fingers reflects special fitness of these creatures to life in snowy mountains. It is easier for them to hook by such strong fingers on small ledges and cracks of steep rocks. The increased area of the sole facilitates the animals to move on the snow. Mobility of fingers and opportunity to bend and dig them into snow also stabilize their motion. The aim of this research is to select from available data on Himalayan tracks those, which could be made by similar animals. The problem is that in spite of numerous expeditions to Himalayas only few photos of hominoid tracks have quality sufficient for analysis. After the publication  French biologist Francois de Sarre indicated me in Jean Roche's site four photos of tracks taken by geologist Pierre Bordet in the Himalayas (area of mountain Makalu) and published in 1955 . He also sent me the full text of Pierre Bordet's report. The first of these photos is presented on Figs 2. Fig. 2. The first line of tracks from Pierre Bordet's photos, 1955. A - full snapshot, B - enlarged two first tracks. It clearly shows details of the two first tracks. They are evidently made by four-fingered feet. The track #1 shows, that the right leg with two large fingers deeply dug into snow on this step. Two outer fingers have left rather shallow prints. This shows that they are much shorter. 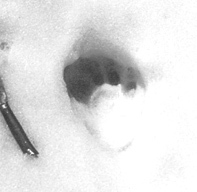 The track #2 of the left leg shows four deep holes from fingers, left of which is slightly covered by snow edge of the track. The question arise: why the right and left legs of the same hominoid can leave so different tracks? Fig. 3 shows how hominoids with the Shipton type leg form such prints on a snowy mountain side that slopes down. Figure 3A explains (side view), how the hominoid in Bordet's first snapshot may put legs into snow with fingers pointed downwards to made such tracks. Figures #B1 and #B2 (rear views) show, how fingers of right leg (1) leave shallow tracks, and of left leg (2) - deep ones on a snow-covered slope. When the leg is vertical, level of snow on its side turned downhill is lower, than on the side which is turned uphill. Fig. 3. A - the hominoid put its feet pointed downwards at walking on a snow-covered slope; The scheme shows how tracks #1 and #2 could appear. Thus, there is a good reason to conclude that the hominoid whose tracks were photographed by Pierre Bordet, was of the same kind, as ones that left Shipton prints. The following tracks of this line are interesting too, though neither holes from fingers, nor bottom of the tracks are visible. They have the specific character in their forward part, that forms lines reminding of forked swallow tail. Evidently, such form appears when hominoid moves on deep snow and big fingers draw these strips when leg goes up and ahead for next step. Next P.Bordet's snapshot on Figs. 4 shows another pair of hominoid tracks. Fig. 4. Tracks of hominoids in P.Bordet's second frame: A - the whole picture, B - the zoomed image of a track #2, C - contours of overlapped tracks. The trace #2 evidently represents two overlapped prints. The upper is entirely seen it is completely consistent with traces from Shipton print. It is made by creature's four finger right leg with two large and two small fingers. His right contour is covered by small lumps of snow. This part is marked by dotted line. It is interesting such feature of this track: pairs of big and small fingers are divided so, that a snow wall has arisen between their prints. The previous track of the first hominoid is mashed by the last one, but one of the fingers of the bottom track is seen. It is hard to say anything about its size because only small part of it is seen. The heel part of track #1 remaines outside the frame, but to all appearances this print also consists of two overlapping and was made by creatures going along one after another. P.Bordet's third picture shows one track similar to track #2 in his first snapshot. After clarification of the frame four finger holes are revealed, and it is seen that the outer small finger is set aside more, than in the previous snapshots. Structure of snow shows, that the track has already melted, and the handle of the knife laying nearby gives general impression of track size only. Fig. 5. Print of a hominoid track from the third snapshot by P.Bordet. P.Bordet's fourth snapshot shows the line of tracks across snow-covered mountain side. The slope was approximately 35-40 degrees, that confirms validity of the scheme shown on Fig 3. Next relevant hominoid footprint was photographed by Anthony Wooldridge early in March 1986, Figs 6. He took the photo in northern India areas near to Nepal borders . Fig. 6. Tracks of a hominoid, photo by Anthony Wooldridge. A - a line of tracks, B - a single track. Tracks had been found out at height of 3300 meters on snow-covered slope which was overgrown with rare bushes. Wooldridge made only two pictures of tracks: a line and a separate track. The trace was still fresh ans distinct, the length of it was 10 inches (appr. 25 cm). It is a bit smaller, than the Shipton's tracks. On Fig.6B it is well notable the feature marked above on P.Bordet's tracks - short snow wall between fingers. One may assume, that these tracks were made by the similar creature as in previous analyzed cases. The group of tracks, presumably belonging to big hominoids of an unknown species in Himalayas, is revealed from existing hominoid footprints data. The main characteristics of such tracks and feet that produced them are described. I thank hominologists Francois de Sarre and Jean Roche for the materials of P.Bordet's expedition. 2. Bordet Pierre. Bulletin du Museum d'Histoire Naturelle de Paris. 1955. 3. Wooldridge A.B. First Photos of the Yeti: An encounter in North India. Cryptozoology, �5, 1986, pp.63-76.